It really will hold water, at least for a little bit! 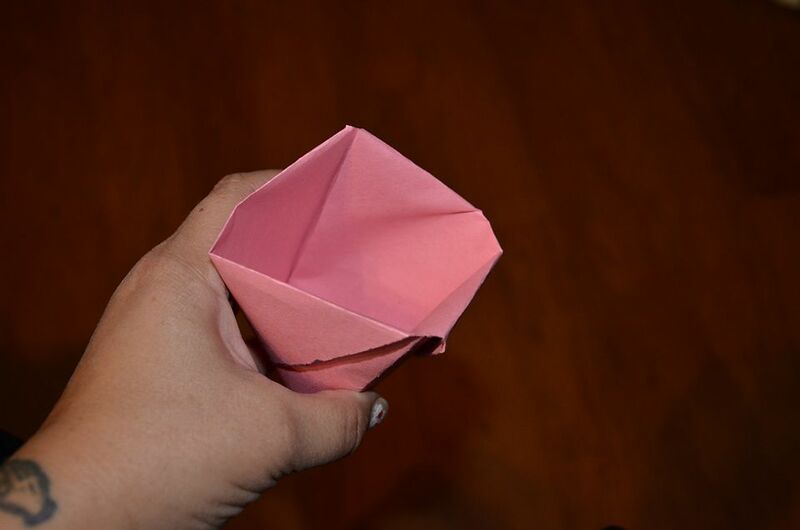 You can make this paper cup with one single sheet of paper. You only need one thing for this project, one single sheet of paper! We used construction paper for this project, but you could use printer paper or even notebook paper if you like. Most sheets of paper come in the size of 8.5 x 11. That isn't a square though, it's a rectangle. We need to make our paper into a square. You can do this by making a few folds. First bring the upper corner down to the bottom, lining up the straight edge. Now turn your paper where the point is up and fold the bottom edge up. Be sure to crease it. We just gently tear along the crease, but you can use scissors and cut this strip off if you like. When you unfold the paper, you should have a square. Now we are ready to fold the paper cup. Refold on the original diagonal line. You should have a triangular shape. Now take the bottom left point and fold over to the right side. Now repeat on the opposite side. Take the top layer of the top point and fold down. Flip the paper to the opposite side and repeat the last fold with the other top layer point. Now just open the paper cup from the top and you are ready to try it out. Experiment with different kinds of paper to see which will hold liquid the longest!